Most people outside the Netherlands are probably only vaguely aware that it used be ruled by Spain. For Dutch people however this experience is seared into their collective memory. Especially since it took a war, lasting 80 years (1568-1648), to get rid of the Spanish yoke. A key event in the run-up to this conflict took place in 1566 when a Dutch delegation came to see the Spanish Regent, Margaret of Parma (ruling on behalf of Phillip II) with a list of requests. One of her advisors would have been right at home in 21st century politics. He counselled the Duchess not to pay any attention to them since ‘they are only beggars’ (geuzen). This high-handed dismissal of the legitimate concerns of the Dutch people led directly to a war that Spain could ill afford, with massive loss of life on both sides. Let’s fast forward to today. It seems our global elites are not keen students of history. The weapon of choice when it comes to the concerns of the ‘common person’ is still to sneer at them. There is of course just one little problem with the tactic of trying to shame your opponents into silence. It may work for a while (in fact it can be argued that it worked out quite nicely for the left for decades). Still, it has a limited shelf-life. People can be forced to abide with a system that is clearly not in their best interests for only so long. So, eventually, those on the receiving end of the insults cease to care. In fact they may even embrace such insults as a badge of honour (see, for example, Trump’s ‘Deplorables’). If pushed still further they will react. When they do, this reaction will have moved beyond polite attempts for their concerns to be listened to. The stark reality is that authorities who engage in the politics of contempt will have to deal with the concerns of the common people eventually. They can do it at the outset by engaging in respectful dialogue, which is after all what democratic governments are supposed to do. Or they can demonise and insult…and eventually reap the whirlwind. There are many explanations for the Yellow Vest phenomenon in France. Very near the top must be the simple fact that if you are not willing to listen to respectful appeals for debate across a table, you may sooner or later have to listen to calls for your downfall from across a barricade. And the Dutch Beggars? Well, they came to glory in that name. It was especially their ‘maritime division’ (the so-called ‘Sea Beggars’) who struck decisive blows in helping to liberate their country through their decimation of Spanish shipping. Who cares what names you are called as long as you are in the forefront of a victorious fight for freedom? Tone deaf 21st century politicians thumbing through their dictionaries for ever more creative ways to insult the common people will do well to take note. Melbourne, Australia: On Friday 9 November a Somali-background Muslim man, Hassan Shire Ali, went to Bourke Street in the centre of Melbourne, intent on causing carnage for the sake of Allah. Just a stone’s throw from the Victorian State parliament Ali set fire to a van filled with propane cylinders in the hope of triggering a massive explosion. When this failed to materialise he went on a stabbing spree, wounding two people and killing one. The person who died was a ‘Melbourne icon’, Sisto Malsapina, co-owner of Pellegrini’s Coffee Bar. In terms of casualties this was a relatively ‘small’ attack (although, of course, devastating for all involved). Yet, it once again demonstrated how far we still have to go in terms of honestly acknowledging that we have a problem with Islam. In fact, the Australian establishment seems to have gone into full ‘protection mode’ in order to ensure that no uncomfortable questions were asked about the role of Islamic teaching in inspiring the attack. The way in which this was done was so predictable that it was almost comical. A kind of paint-by-numbers response to terror that seemed to say: ‘Nothing to see here, move right along’. If it was not for the fact that the lives of people are being put at risk by this, one could almost admire everyone involved for sticking so closely to the script. • As soon as it became clear that the attacker was a Muslim shouting ‘Allahu-Akbar’ as he did the deed a lightning-fast diagnosis of mental illness was dangled before the public, with his family stating that he is ‘delusional’. Of course, this testimony (by those with a vested interest to cover for their faith) was immediately accepted at face value by the credulous Australian media. Some of whom even called the atrocity a ‘Cry for Help’! • Almost as quickly a statement was produced by the mosque frequented by the attacker (Hume Islamic Centre) to deny that he was ever a regular attender. This statement has since been thoroughly disproved, but was still useful in the immediate aftermath of the attack as a means of duping the public into believing that no ‘respectable’ mosque could teach anything dangerous. • After these two stock-standard bits of obfuscation the ‘grievance machine’ sprung into action. When Australian Prime Minister Scott Morrison very tentatively suggested that a bit of soul-searching might be in order for the Muslim community, a storm of wailing and hand wringing was unleashed. The ‘Grand Mufti’ of Australia and other Muslim leaders rejected with scorn any notion that they could have done anything to prevent the attack and accused the Prime Minister of bigotry and discrimination. • This was just the opening salvo however. Australian Muslim commentators rushed to find typewriters and microphones to bellow out their indignation. Not at the loss of life, mind you. No, apparently something far more serious had to be addressed. The real victim, it turns out, was the Muslim community. One example should suffice. Columnist Randa Abdel-Fatah was given reams of space in all of Australia’s major newspapers with an article entitled ‘I Feel Nothing But Rage, Alienation and Despair’. What was the rage about? That a family and city is grieving the loss of a much loved father and patron? Think again. Apparently, it is much worse that some people so much as dared to ask questions about whether, just possibly, the Qur’an might have had something to do with all of this. I see your atrocity and raise you the victim card! • Then there was, lastly, the ultimate fallback position: Moral Equivalence. Muslim Australian member of parliament and Counter-Terrorism Expert (I’m not making this up), Dr Anne Aly, essentially said that the attack was no-big-deal since, wait for it, domestic violence exist in Australia: “Violence perpetrated by violent jihadists, or radical islam, as the prime minister wants to put it, pales in comparison to the number of women who are being killed every week in domestic and partner violence.” There you have it. It seems we have bigger fish to fry, so Islamic terror should only come on the agenda when domestic violence is under control. This from a women whose area of academic expertise, again I kid you not, is counter-terrorism. The mind boggles! Again, how can it be that after all we’ve seen and been through these stock-standard responses to Islamic terror are still blindly accepted by the masses? If anything, these events just confirmed that we need to redouble our efforts to get people to seriously think about the essential nature of Islam. A good place to start in investigating the link between Islamic teaching and violence is my book ‘Nothing to do with Islam – Investigating the West’s Most Dangerous Blind Spot’. Get your copy today. This verse has obviously been a massive bone of contention between the two faiths and has been endlessly debated. The purpose of this section is not to enter into this debate, but to show that this verse was almost certainly a later addition to the Qur’an. Thus, providing another piece of evidence for the self-evident truth that the Qur’an simply did not exist in the form that it does today at the end of Muhammad’s life. The claim that this verse is a later addition is strongly confirmed by the fact that it is entirely absent from the earlier stages of the developing Islamic tradition. 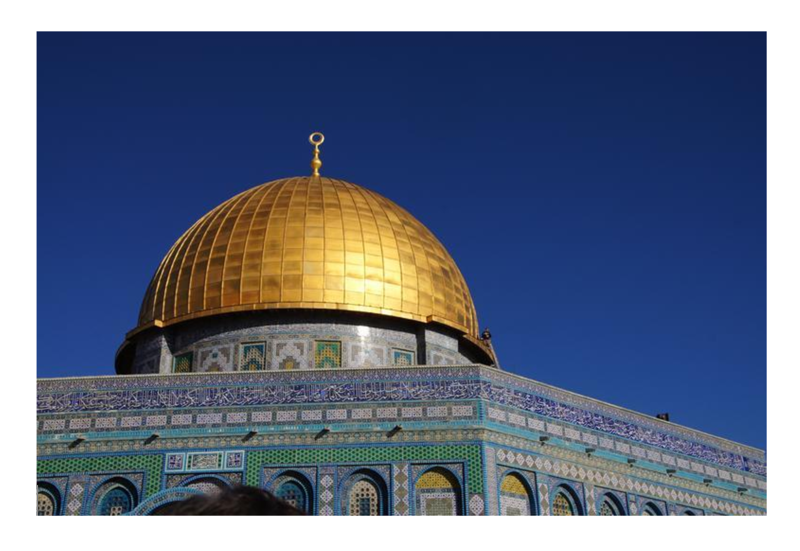 The Dome of the Rock in Jerusalem was constructed in 691 CE by the Caliph Abd Al Malik (646-705 CE), quite specifically to act as a visual statement of the errors of Christianity from an Islamic perspective. There are verses on the Inner Ambulatory denying the Trinity, the idea that Christ is the Son of God and that call Christians misguided. The presence of this visual statement in the heart of Jerusalem, the place where Christianity emerged, must have been a strong reminder to believing Muslims to completely reject the Christian version of the events surrounding the life of Jesus. It was also a calculated snub directed at the Christian believers of Jerusalem. Now, what would these Christian believers regard as the most important event ever to have happened in Jerusalem? Given the attention paid to this in the Gospels, the answer should be obvious: The crucifixion. Yet, there is one verse that is conspicuous by its absence in the Dome of the Rock’s repudiation of Christianity: Qur’an 4:157 cannot be found on any of the original inscriptions of the Dome of the Rock. The Qur’an is, furthermore, one of the most commented on books in history. Visit any Islamic library and you will see many commentaries on the sacred text so deeply revered by Muslims. Some of these commentaries will have something akin to canonical status in the sense that they are part of the official Islamic theological tradition (known as Taqlid). When we pick up these ‘official’ commentaries, we find them commenting in detail on all the verses of the Qur’an. Well, almost all of them. There is one verse that is conspicuous by its absence. You guessed it: Qur’an 4:157 is not discussed in any of the earliest commentaries! Think for a moment why this would be the case? It cannot be because this verse has no theological importance. Instead one may consider it as one of the most theologically loaded verses in the Qur’an given its importance for the way in which the followers of Islam are supposed to view Christianity. In fact, many modern Muslims take their cue from this verse as teaching them to absolutely detest the cross. The only possible explanation as to why this verse is absent from the commentaries should be blindingly obvious. It could only have been excluded because the verse in question was not part of the Qur’an at the time when the commentaries were compiled. This conclusion obviously raises all sorts of question about Islamic history and the truth-claims that are supposedly solidly based on this history. For more on the origins of the Qur’an and how this definitively disproves Islam’s ‘official’ historical narratives see my book ‘The Mecca Mystery – Probing the Black Hole at the Heart of Muslim History’. (Full references related to the statements above are also include the in book.